A maintaince worker found the key to the campus computer lab, which had been missing for over 15 years. Students can now access 20 PCs running Netscape and WordPerfect. For the first time since the Sewage Leak of ’02, the administration cancelled classes, this time due to snow. In the morning, hundreds of students committed to using the day to catch up on reading for classes. In the afternoon, hundreds of students learned not to make plans based on the assumption that the liquor store would be closed due to weather. Administrators, faculty and students were on their toes for a week as the Accreditation Committee of the state Department of Education conducted its semi-annual review of OMSU. The library was cleared of vagrants, cafeterias switched from “meat” to meat and a Chemistry building was constructed from driftwood and spackle for the occasion. We passed! Students selected sophomore political science major Francis Wellington III as Student Body President by a 10-point margin. Propelled into office with the highly popular “Remember When I Bought You a Beer?” slogan, Wellington plans to use the office as a springboard from which to transfer. Members of the Class of 2010, family and well-wishers packed the Fourth National Bank of Fluffton Auditorium on May 22 for commencement ceremonies. Graduation speaker The Blue Power Ranger encouraged students to follow their dreams and make a difference or something. I don’t know why I was assigned to write June, as I spent the summer working in a cannery in Alaska. When I got back, nobody wanted to catch up with me because I smelled like rotting fish until around Labor Day. Is this some sort of joke? I hate you guys. Still in Alaska. It was really hard to keep all of those Sarah Palin jokes to myself all summer. The long line of SUVs and minivans stretching down College Avenue heralded the arrival of the Class of 2014. For the next week, they would be treated to barbecues, trust fall exercises and lice removal. Maintenance Director Lee K. Rouph said this year’s freshman “are far more respectful of the bathrooms than in previous years. Seriously kids, the fact that nobody is running a moonshine still or having gravy-filled water balloon fights makes my life worth living again.” ”Of all the things to sneak out of the cafeteria! Why not a nice apple for a snack later?” he added. Only in the fevered imaginations of cartoonists and cruel circus owners would a fight between tigers and pandas be an even match. Yet on one cloudless Saturday, it was a duel to the very end between the Northern State Tigers and our OMSU Fightin’ Pandas. Following a series of successful trick plays gleaned from Air Bud: Golden Receiver, the Pandas stood one touchdown away from victory with one second on the clock. A perfectly-executed 28 Swing Right Heel Goodboy ended with RB James Yu holding the ball in his mouth in the end zone. Alumni from far and wide came back to campus for OMSU homecoming. The Class of 1960 dedicated a new bench. Back to form, the Fightin’ Pandas lost 41-13 to Spiro Agnew High School. After months of delays, the Student Center opened on October 24. The facility is the result of an in-kind services settlement with DiFazio’s Good-Enough Non-Union Construction for constructing the Physics Department building completely upside down. With an absurd court-ordered budget of $23 million, the university decided to ask students what they wanted to do with the windfall-funded facility. Suggestions were drawn, seemingly randomly, from submissions to the OMSU website. Students can relax in a giant ball pit like 4-year-olds, play shuffleboard like 70-year olds and don a kente cloth single-breasted blazer to represent Ghana in Model UN like a 19-year-old. However, state law forbade the complete implementation of the hashish bar suggested by several students, but the administration compromised and put in a Taco Bell that plays jazz. 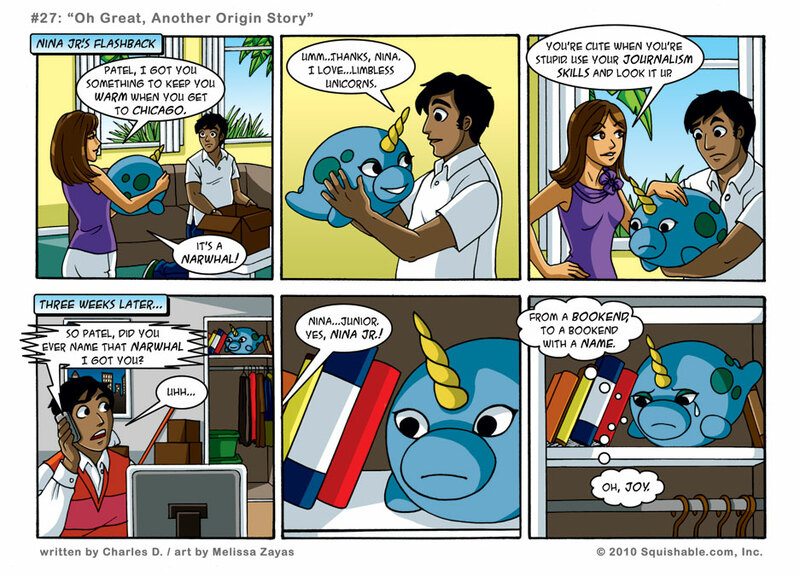 Aww, the sad Narwhal made me sad! I need to go hug mine now, and his name is Monodon. HELLO PATHOS! LONG TIME NO SEE! Squishables are for feeling better, not feeling worse. and then nina jr will ninja everyone in the face w/ her horn! hai-YA! D’AWWWWW! Poor Ninja Junior! Squishables should be sqished by humans, not books! Happy New year to all you wonderful squishables out there, and especially Otto, and much success in the new year!! a flashback IN another flash back? crazzzzzzzzy! and i always thought it was NINJA jr. not nina. boo.